Fritz left today for a week at Boy Scout camp. I’m sure he will have tons of fun, especially when he works on his Rifle Shooting Merit Badge. Previously, whenever he went camping, he used a super deluxe toiletry kit: a zip lock bag. We spare no expense in outfitting our children for their adventures. This year, I decided to make him a real toiletry kit. I found this well-done tutorial, but of course, that’s a bit too girly for anyone with a Y chromosome. My boy needed something manly, and there’s nothing much manlier than a military uniform. And we have plenty of those. I hate to get rid of my husband’s old uniforms. There is so much useful fabric there. And cool pockets, too. You can try to sell old uniforms at an Army/Navy store, but they don’t net you much. You can donate them to Goodwill or the Salvation Army, and I suppose a homeless man, somewhere, will be very grateful. Or you can keep them until you come up with a project that would look cool in camouflage. Here is Fritz’s kit. Not only is that a genuine BDU top, that name tape was stitched on by a real imported Korean seamstress at some Clothing and Sales store at some Army post somewhere (probably PA or NJ). Can you believe that both my husband and Fritz asked if I was going to cut off the buttons? They have no sense of artistry. Here I have unfolded the kit so you can see both the front and back. 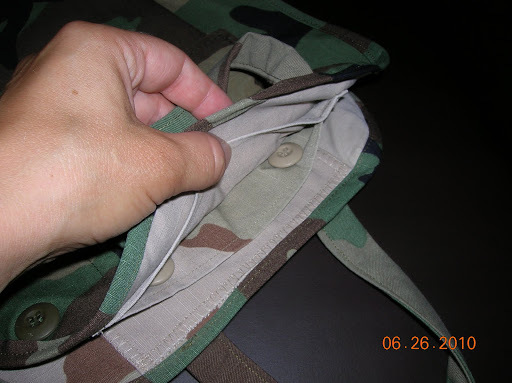 If you are familiar with BDU tops, you will recognize the top pocket on the front and the bottom pocket on the back. Those pockets button closed and can hold a number of items securely. This is the inside. It is made from a different camo pattern – the desert shade. The green uniform was worn by my husband in Kosovo (and various places in the US). The tan uniform was worn by one of his friends in Iraq and Afghanistan. The toiletry kit has been around the world. The friend was getting rid of his uniforms, so my husband took them, because he knows I can’t stand to throw Army uniforms away (seeing as how there is so much useful fabric there). I followed the tutorial for the tool pocket on the top side shown here, but decided to just use another uniform pocket for the other side. To hold the kit closed, I used two buttons from the tan uniform and their button holes which I just stitched to the tan fabric before stitching the two sides together. 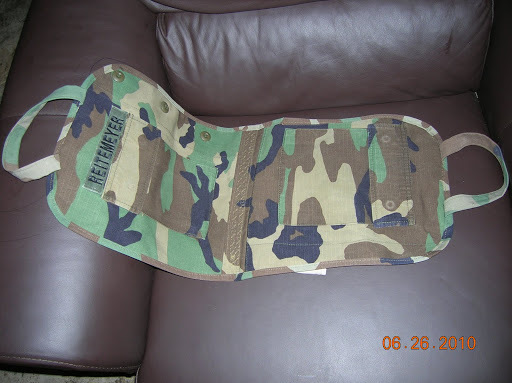 I’m pleased with the results, and the best reward was having my son say, “Cool!” I plan to make two more like these (one for Billy and one for my girlfriend’s son) and then 3 half camo/half girly fabric for Katie, Jenny, and my girlfriend’s daughter. I’ll be sure to post photos when I do those. The BEST PART is that I made the whole thing without a single trip to the store. Except for the thread, which I had on hand, all components came from the uniforms (small note: I did not use any cotton batting or interfacing in this kit as the tutorial suggests, nor did I put in the zippered pocket). I love recycling Army uniforms. This entry was posted in recycled uniforms, sewing projects. Bookmark the permalink. That is the best AND coolest toiletry kit ever. My sons are jealous. They'll be getting ziplock bags. You're the best Mom, ever!!! Let me know when you start taking orders – I have some old uniforms and some boys who would really like those – and I don't sew. Wonderful! I'm so tired of the uniforms hanging in our closet, but I guess one year into retirement is too soon to ask him to get rid of them. Definitely make an announcement if you're taking orders for the toiletry bags! Cool! Do you have a pattern for that? I'd love to have Emily make something like that for Ben but she's a novice sewer and needs a pattern. What a fabulous job, Michelle! 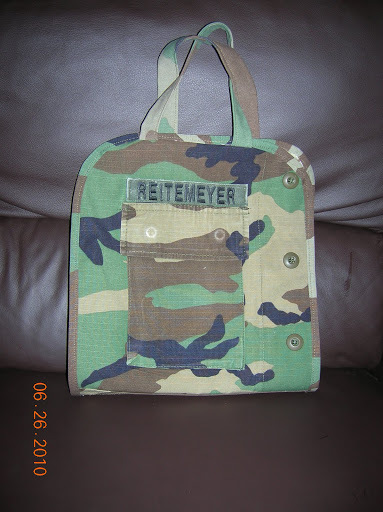 I'm so excited with how it turned out…especially that you recycled the BDU fabric and pockets. Wonderfully done. This is great! Thanks! I definitely want to make a few of these. I, too, enjoy using Gary's uniforms. 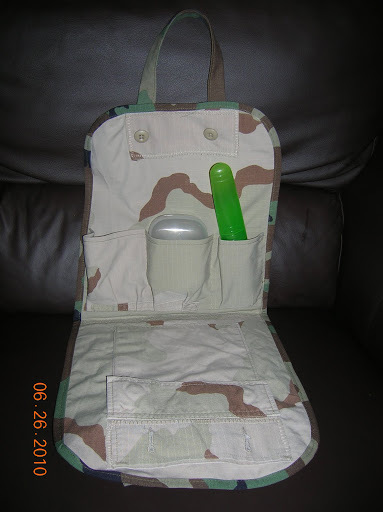 Fritz will be well equipped for Boy Scout camp, the trick may be getting him to use the items inside. Will went to camp last year and not only forgot soap (they don't sell it at the trading post), so he didn't bathe for 6 days, but I doubt he brushed his teeth all week. Yuck! You will have to put the pattern number up on the blog, we have some old cammies that would be much better utilized as a dop kit than hanging in the closet collecting dust. Fabulous, fabulous, fabulous! Thank you so much for sharing. Is it as cool, though, if they're made using Mom's uniforms? Found you via the Pickup Some Creativity post about these… they are awesome! My hubby recently retired from the Air Force and now I know what to use all those old uniforms for! Thank you for such a fabulous idea!